Valley teen Mikayla Lowry received a $100,000 scholarship to college from Beyonce and Jay Z. 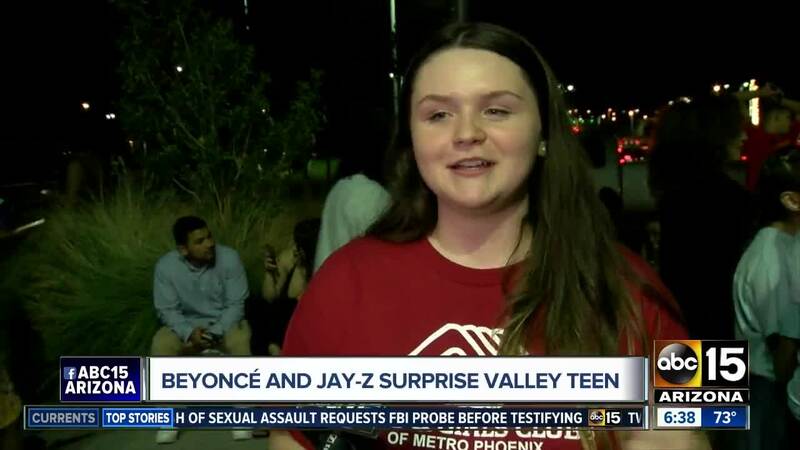 The Beyoncé and Jay-Z show in Glendale was a concert of a lifetime for many fans, but for one teenager it was completely life-changing. On Wednesday night, the musical power couple surprised Mikayla Lowry with a $100,000 scholarship to attend the college of her dreams. Lowry, an attendee of the Boys and Girls Clubs of Metro Phoenix, said she was completely shocked when DJ Khaled took the stage. He announced that Beyonce and Jay Z had something special for someone with a 3.7 grade-point average, and an interest in marine biology — both something Lowry has. "They said my name and I was like, 'WHAT?'" Lowry said after the show. "It just felt unreal." Lowry said she will be the first in her family to go to college and she's grateful her financial worries about education are gone. Teenagers at other concerts around the country have also received scholarships from Beyoncé and Jay-Z. The scholarships are provided courtesy of The Shawn Carter Foundation and the BeyGOOD Initiative . According to The Shawn Carter Foundation website, "the mission of the Shawn Carter Foundation is to help individuals facing socio-economic hardships further their education at post secondary institutions." The BeyGood Initiative is a program that has provided scholarships, emergency outreach and other philanthropic awards.